Candles burn for our pets in need! and leave a prayer for a pet in need. I whisper pleas into this light. Let them know your light is theirs. Now We need your Saving Grace. and let your Love fill the Lands. You made this world for all to enjoy. You brought us to our babies each little girl and boy! For all the bounty you bring to our table, we thank you. Give them their want to keep them from harm. Give us more time so dear. But I don't know how I'll go along. Give me strength to turn to you. To help my babe make it back to me. To guide me in the proper choice. In the Loving Flame no one can steal. is known and the deity knows why you're there before you even light the candle. I'm nobody's poet, but they're only guidelines for folks to use as they see fit. 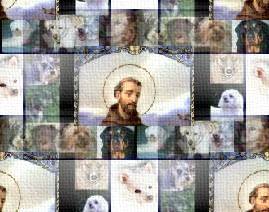 You can send your pet's picture to be included on the St. Francis Page.